In news so insane you might not believe it's actually true, on Monday, the city of Cleveland blamed Tamir Rice, 12, for his own death after the child was shot by a rookie police officer for brandishing a BB gun last November. According to federal court documents, which were filed Friday in response to the Rice family's wrongful death lawsuit against the city, the family's "injuries, losses and damages ... were directly and proximately caused by the acts of the Plaintiff's decedent, not this Defendant," reported CBS News. According to the city's lawyers, Rice also failed to "exercise due care to avoid injury." The day before Rice's death on Nov. 23, 2014, the 12-year-old had been sitting in a local park, holding an airsoft pellet gun. An area resident had called 911 to inform them of his presence, claiming that Rice had been waving his pistol around to scare passersby, although the caller told the dispatcher twice that the gun Rice had been holding was "probably fake." Within seconds of approaching in a squad car, responding officer Timothy Loehman shot Rice in the abdomen. Cleveland deputy chief Ed Tomba told reporters that Loehman had given Rice "three commands" to show his hands prior to shooting, alleging that Loehman had called out from the squad car. Rice was rushed to a nearby hospital and died the following morning, and both Loehman and his partner Frank Garmback were placed on administrative leave pending an investigation. There are a number of things that we in society don’t allow 12-year-olds to do. We don’t allow them to vote, we don’t allow them to drink. In court we don’t try them as adults. They don’t have the capacity to understand the consequences of their actions. By midday on Monday, the public outcry in response to the court document had become so overwhelming that Cleveland Mayor Frank Jackson was forced to hold a news conference to issue an apology on behalf of the legal team. "In an attempt to protect all of our defenses, we used words and we phrased things in such a way that was very insensitive," said Jackson. "Very insensitive to tragedy in general, the family and the victim in particular." Jackson also called the language "hurtful" and "disrespectful" to both the victim's family as well as the city of Cleveland itself, promising that lawyers would amend the current documentation to employ language that was more sensitive. 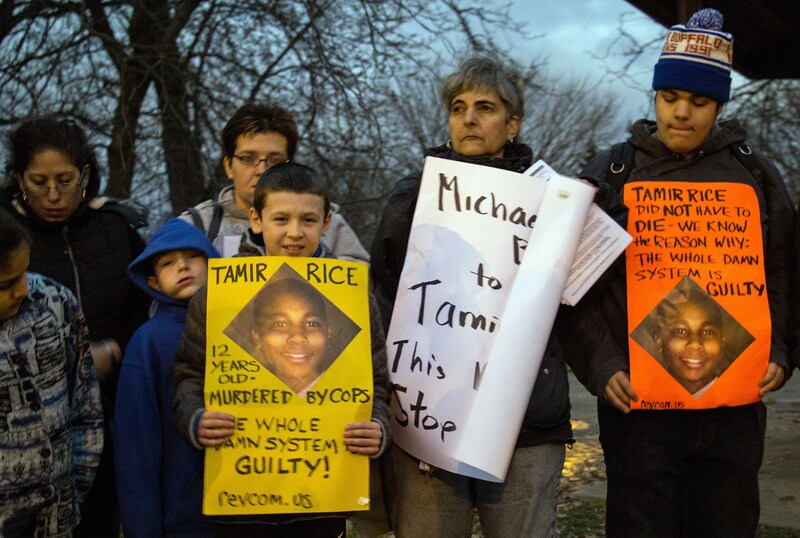 Tamir Rice is in the wrong. He’s menacing. He’s 5-feet-7, 191 pounds. He wasn’t that little kid you’re seeing in pictures. He’s a 12-year-old in an adult body. If that refrain sounds familiar, it's because it has been used before in describing 18-year-old Michael Brown, shot and killed in Ferguson, Missouri in August 2014. According to police reports, Brown, who stood at 6 feet 4 inches tall, had also been "menacing" toward both a local storekeeper and the officer who killed him, Darren Wilson. As Brown had over a foot and 100 pounds on Rice, some have called the city's narrative into question. At what point do a child's physical proportions deem him or her a "menace" to society? Certainly, it's an incongruous question, but it falls in line with the tone already set by the city's defense — one that paints 12-year-old Rice as a violent felon who simply had to be taken out before it was too late.